The 16GB CompactFlash 1000x UDMA Memory Card is a memory card offering 16GB of data storage capacity, giving you ample space for saving your work and your memories. It's designed to excel in digital SLR's and sophisticated camcorders requiring nothing less than the best in terms of speed and performance. 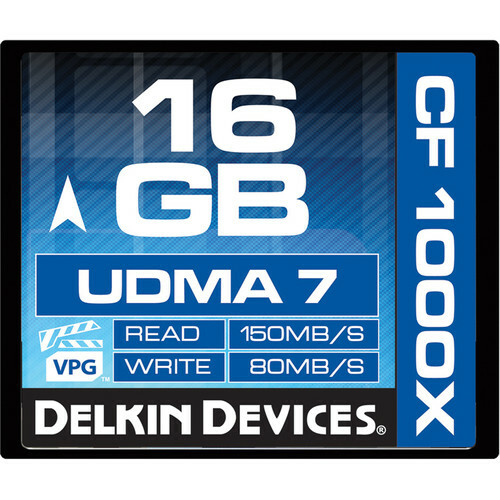 UDMA (Ultra Direct Memory Access) 7 compliance gives this card a highly impressive 1000x speed rating, enabling it to deliver lightning-fast read speeds of 150MB/s and amazing write speeds of 80/MB/s. VPG (Video Performance Guarantee) profiling also contributes to the high levels of performance this card demonstrates. 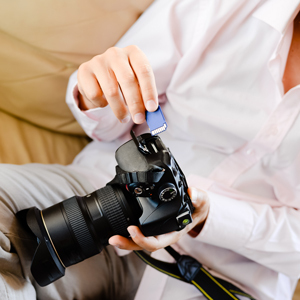 The CF card supports unlimited continuous burst and rapid-fire RAW shooting in certain UDMA 7 enabled DSLR's, as well as under- and over- cranking for professional filmmaking. It guarantees no dropped frames or slowing down of your camera's buffer--even under the most demanding shooting or recording conditions. The card is great for slow-motion video playback, too, making it a valuable cinematic tool. Contrary to memory cards mass-built in overseas facilities, Delkin's CF 1000x is engineered with carefully chosen and controlled components to increase useful life, reliability, durability and overall quality. Proudly made in San Diego, CA, U.S.A. and supported by Delkin's lifetime warranty, this card is one you can trust to deliver the highest speed and performance for the long haul. Box Dimensions (LxWxH) 6.1 x 4.1 x 0.1"
16GB CompactFlash 1000x UDMA Memory Card is rated 4.3 out of 5 by 6. Rated 1 out of 5 by Sofamonkeyz from BSOD Computer won't recognize these with a card reader. Keeps freezing up. When I ejected the card I got the Blue Screen Of Death on Windows 7. Running the card through my camera and usb causes my compter to be sluggish but at least works. Perhaps I need a faster card reader. However, with a card that costs this much I would at least appreciate a warning or firmware that blocks my computer from potential damage. Rated 5 out of 5 by Anonymous from As advertised Sports photography with Canon 7D in full continuous mode: pictures look great without any dropped. I don't even need to edit them. Perfect card for this use for me. I am also looking forward to using it for video. Rated 5 out of 5 by Doug from SUPER SPEED CARD I am using these cards extensively and dumped my Ridata cards as they had limited warranty and kept failing. The Delkin cards write in my DX very fast and down load faster. No negatives to report. Rated 5 out of 5 by Michael from Works As Advertised Using with my 7D MKII this is one fast card and downloads are amazingly fast using a USB 3 card reader. Rated 5 out of 5 by Shasta from Excellent card I use Delkin compact flash cards, and have not had a problem with them.